The idea was to send a Polaroid camera and about one hundred Polaroid photos to graffiti writers of different nationalities, with the task to shoot their everyday life, and to give them complete freedom in the choice of the motifs. It is surely this kind of freedom which makes this book so special, but also the fact that all these unpublished photos were taken especially for the book. In the beginning of the 21st century, graffiti seems to be taking a line that is totally against its original motivation. On the one hand, this might be caused by more severe penalties, on the other it is due to the increasing incorporation of the media and big business. Thus, we decided to present such artists who devote themselves to this art in a committed way. They do not succumb to commercial pressure and bring new life into this movement. 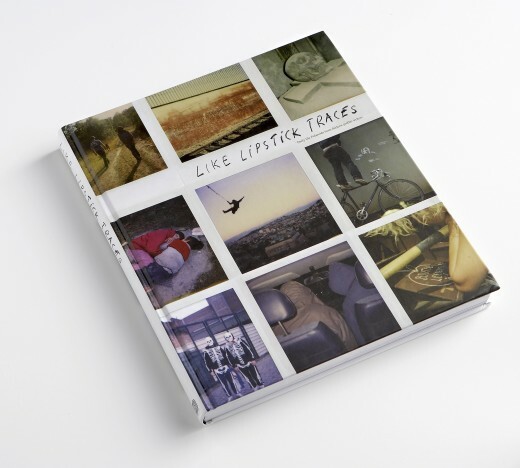 Like lipstick traces comes from the title of a book (lipstick traces) written by Greil Marcus describing alternative movements of the 20th century, like Punk, Lettrism, Surrealism, and Dadaism. The author analyses the Protest Culture which had developed in Europe and which, in his eyes, was the origin of those alternative movements. Metaphorically, he entitles them scars of history. After we read this book, we thought that graffiti could also have been part of it. Thus, we decided to give birth to the project Like lipstick traces, to humbly suggest an additional chapter, completing the book of Greil Marcus. We want to show that graffiti has become one of those scars of history too. In the beginning, graffiti was considered to be impulsive and marginal: it was not understood, and even treated as a foolish act. Graffiti wasn’t done to endure time or to institutionalise itself. However, some time later, people deemed it a culturally important part of a whole generation, and suddenly graffiti seemed disinfected so the mainstream could assimilate it. Its commercial potential became a sales pitch, especially in fashion and advertising. Nowadays we read on walls, or hear people say, “Graffiti is dead”. It really seems as if the original approach to graffiti no longer exists. Yet there are still those who persist, living out their art and ideas, who keep certain aesthetics, and maintain distance from the institutionalisation of graffiti. It is this kind of writer that we want to present in Like lipstick traces. The 13 artists in the book are beyond the establishment and keep graffiti in motion. They display a certain spontaneity by refusing to compromise and defying the latest incorporations. We decided not to analyse the topic in written form but to let photos speak for themselves because we wanted to keep true to our own perception, which lies in the image. However, we asked the 13 writers to answer three questions*, in order to communicate their point of view regarding the topic of the book. How much distance do you take regarding the history of your generation and the part you are playing? What circumstances, facts, and influences made of you the person you are today? In other words, where do you take the power for your artistic practice from? How did you approach the “task” of shooting photos throughout 2 years? Graffiti and Polaroid : Two things which are very dear to our hearts and which we unite in this book. We profit from more than ten years experience with graffiti and Polaroid. The choice of artists was based on several criteria : their geographical background, their graffiti style, their generation, and their media presence. On the one hand we want to present a geographical and cultural diversity. That is why we dealt with artists of different origins. On the other hand, the choice is also based on their style. Not only do we want to present a large range of styles, we do not want to lose sight of the real idea of graffiti : the illegal, beyond the latest trends of Street Art, communicated by the Internet. The 13 writers were also chosen because most of them are rarely presented in magazines or books. Lastly, we chose writers of different generations – from the 90s to the year 2000. Therefore, Like lipstick traces offers a modest, international review of a marginal graffiti art that resists and protests continuously. We want to emphasize the artists’ surroundings, their everyday life, their families, friends, homes, their journeys, and anecdotes. Catching snapshots and instant photos of their lives to leave marks. In many ways, the snapshot is embodied by the Polaroid. We think that this is the perfect medium for this kind of photography, and also want to oppose the popularity of digital photography. The photos taken are unique, cannot be reproduced, they have their own particularities and have a totally idiosyncratic quality, similar to a style of the 70s or 80s. Furthermore, we chose this kind of photography to give the book a graphical unity: every picture has the same, clinical format. In dramatic turn of events right in the middle of the production of our book, Polaroid suddenly announced that it would discontinue the production of all its instant films! The pictures introduced in this book then become the last witnesses to a photographic process that will have left its mark on history. Having decided to realise the project, it became clear to us that it had something uncertain and that it was also committed to coincidence. We didn’t know what the content of the book would be. Yet, it is those difficulties and those risks that makes the project so special and interesting. It was not always easy to communicate with the different artists, because they all have different personalities, they operate differently, and are not always immediately available. This is also one reason for the long duration of the project: we received the first photos in May 2006, the last ones in February 2008, some never reached their destination, and for others the camera had to be sent three times (because it had arrived damaged or had been confiscated by police). A peculiarity is that we didn’t give any instructions regarding the content of the pictures. Thus, some photos are banal, botched, blurred, under or overexposed, scratched, scuffed, or have written notes on them. Nevertheless, it is in these amateur photos, whose technical aspect is disregarded, that reality is shown. They have a special meaning to the artists because they are instant shots of their lives. The freedom of choice of the motifs was allowed in order to stay as closely as possible to the idea of graffiti and alternative movements, and furthermore, to show a timeless content: spontaneous, subversive, motley, in defiance of the mainstream system.